Mount Angel seminarians have always been attracted to hiking and other outdoor pursuits. 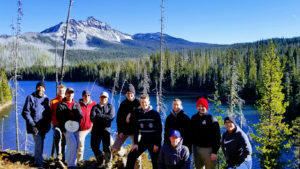 So it was natural for current seminarians, inspired by the life and spirituality of Blessed Pier Giorgio Frassati, to form a fellowship group devoted to seeking God in the wilderness. The group has organized a number of weekend outings, including one camping trip last fall. On the trip, priests who accompanied the seminarians celebrated the Eucharist at the campsite. “Two Masses were celebrated on beautiful Merrill Lake up by Mount St. Helens,” said seminarian Adrian Sisneros, second year theology student for the Archdiocese of Santa Fe and group co-founder. Sisneros grew up as an avid hiker and outdoorsman in the mountainous desert of New Mexico. He enjoys seeking out places of beauty in the Northwest and encountering God on mountaintops, rivers, lakes, and beaches. Each Frassati Group trip, he notes, has a strong spiritual component, and helps bond the seminarians. The group members also recognize that these experiences are great preparation for their future ministries in parishes and other settings. They work together to carefully plan the trips and utilize each person’s skills and abilities. Sisneros said even the challenges they’ve encountered on trips are welcome opportunities for growth.